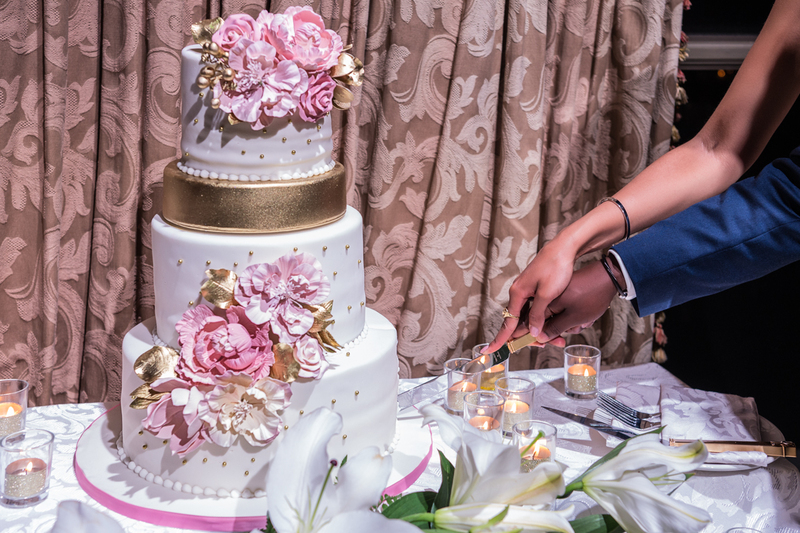 One of the most cherished wedding memories involves the traditional cake-cutting ceremony. A few time-honoured instructions can help ensure that this event is a memorable part of your wedding day. When cutting the wedding cake, the bride holds the knife first and the groom places his hands around her hands. Together, you cut a slice off the bottom layer of the cake and then you pull the slice out on a plate, break it apart with your hands, and then take turns feeding it to each other. The reasoning for cutting the bottom layer first is that sometimes the upper layers of the cake are poorly supported and it is very possible for the bride and groom to push the whole wedding cake over. By breaking and feeding the cake to each other with hands, the bride and groom have the opportunity for a little cake smearing without the potential danger of doing so with forks, as the temptation to smear cake in each other’s face is quite high at this very moment. This is a far more entertaining, memorable, and “photographable” moment than a quick, civilized exchange of small bites using forks.